Moist and buttery cake meets fall apples in Apfelkuchen, a classic German Apple Cake that is the perfect recipe for a fall dessert. 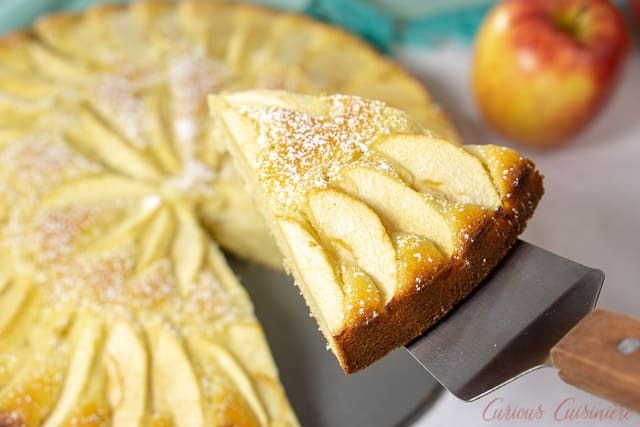 While Apfelkuchen (pronounced AP-fel-KUK-en) is literally translated apple cake, you will find the term used to refer to a number of German desserts, some resembling more of a pie or crumble while others more closely fit what we, in the States, think of as a cake. Either way, they are all delicious and perfect for fall! But, just to straighten out the confusion, let’s look at a few of the most common types of German Apfelkuchen. 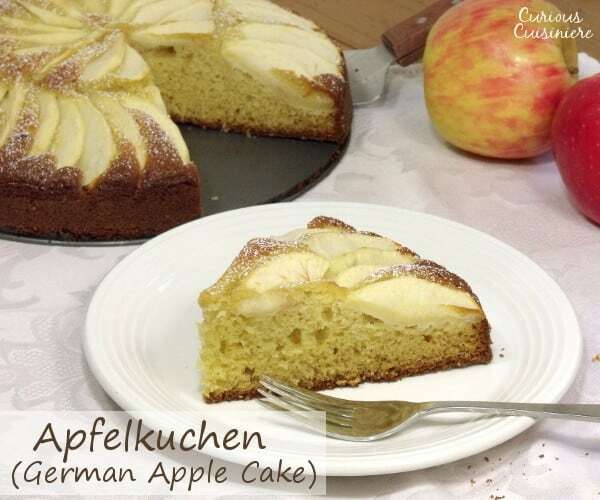 Gedeckter Apfelkuchen literally translates to “covered apple cake“. 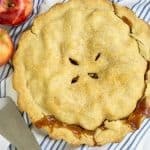 This version is similar to what we think of as a double crusted apple pie, however the top and bottom crust are thicker than a traditional pie crust an more closely resemble a dense sponge cake. Apfelkuchen mit Mürbeteig means “apple cake with shortcrust“. 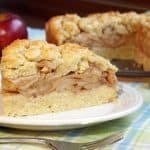 This apple cake is most similar to a one crust apple pie, with the bottom crust being slightly thicker than the American crust, more of a shortcrust pastry. 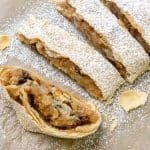 These are traditionally topped with a crumb topping, and the filling could be just apples and spices or a custard mixed with the apples. 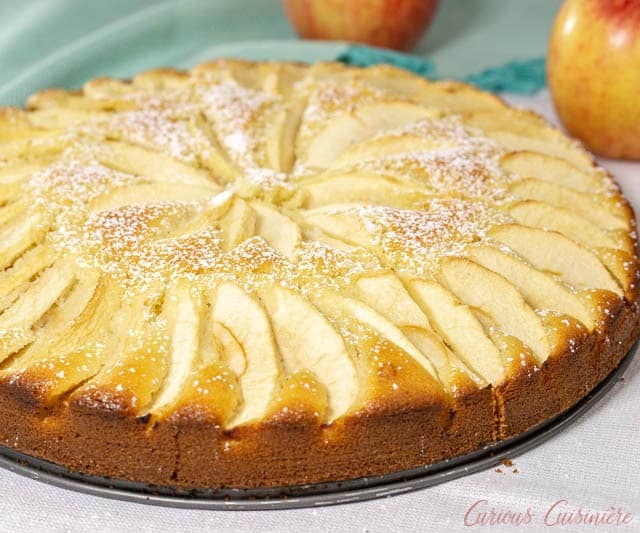 Apfel Streuselkuchen is an “apple streusel cake“. This version is more like a cake that we would think of, with one interesting twist, it uses yeast rather than baking powder. 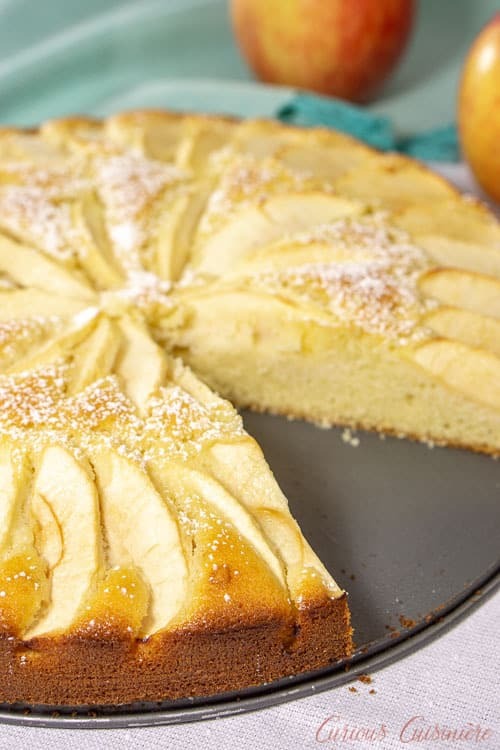 Yeast was the traditional method of rising German cakes, and while some versions have switched to baking powder, many Apfel Streuselkuchen recipes stick to the traditionally used yeast. For this cake, apples are layered over the (typically short) cake batter layer and then topped with a crumb streusel. But, none of these are what we’re sharing with you today. 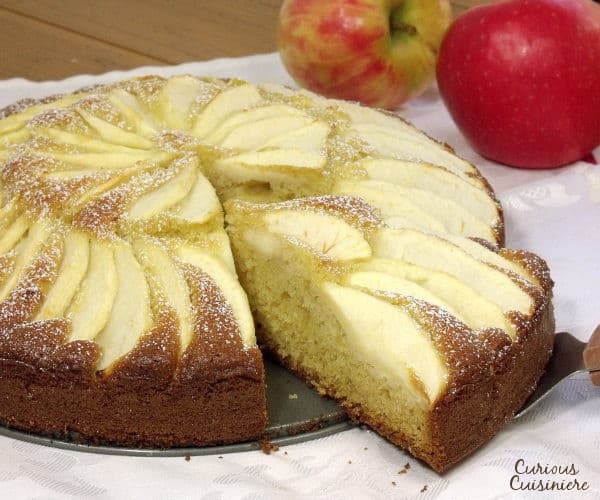 Today we’re bringing you a recipe for Versunken Apfelkuchen or “sunken apple cake“. The cake is called “sunken” because the apples are carefully placed over the batter, which then rises up around them as the cake bakes. The result is a beautiful effect of apples peeking out through the golden brown cake top. Dusted with powdered sugar, this is truly a stunning dessert for any fall table. 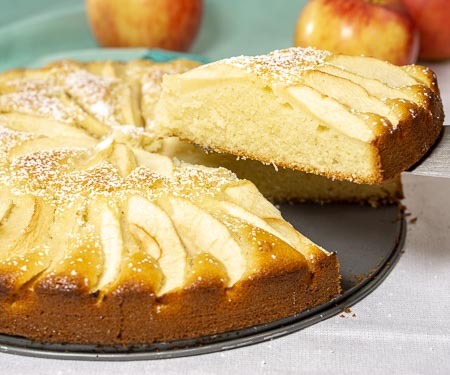 A recipe for baking with apples wouldn’t be complete without a brief look at which apples we recommend for this cake. 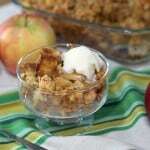 It seems like everyone has their favorite apple for baking, we like a sweeter apple that won’t cook down to mush. Pink Lady – Nice balance of sweet and tart. Hold their shape well in baking. Cortland – Bright white flesh will stay white longer than other apples. They are sweet, but slightly tart, and hold their shape well. Jonathan or Jonagold – Both are tart and slightly sweet apples that hold their shape well. Because of their tartness, they may benefit from added sugar when used in pies. 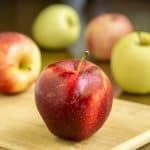 Braeburn – Spicy sweet apples that keep their shape well in baking. Gala – A widely found apple, often the go-to baking apple. Nice and sweet with a hint of tart. Hold their shape well in baking, but the interior does cook down so the chunks will melt in your mouth with each bite. 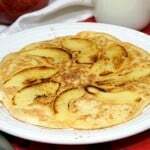 When we make Apfelkuchen, we’ve used either Pink Lady or Gala apples. We really like they way both have a nice balance of sweet and tart. And, we love that they hold their shape so well during baking. Versunken Apfelkuchen is incredibly easy to make. 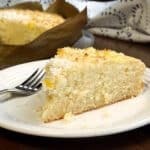 The cake is just a basic butter cake that comes together quite quickly, and is incredibly moist and tender. Apples are arranged over top of the batter like we described above. Some recipes use slices (like we did), while others will use peeled and cored apple halves. Either way, the presentation is quite fun! 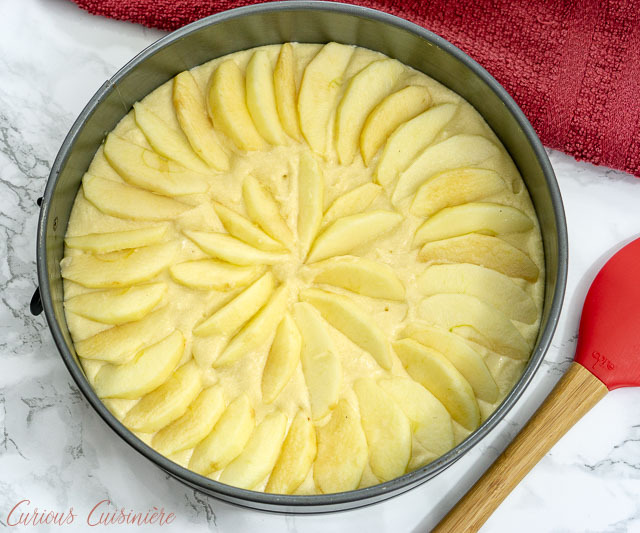 One unique thing about the preparation of this apple cake is that is is baked in a 9 or 10 inch spring-form pan. With the apples on top, you don’t want to have to worry about turning this cake out on its top side. So, baking it in a spring-form pan makes for incredibly easy serving! Apple pie or apple cake? Which would you choose? 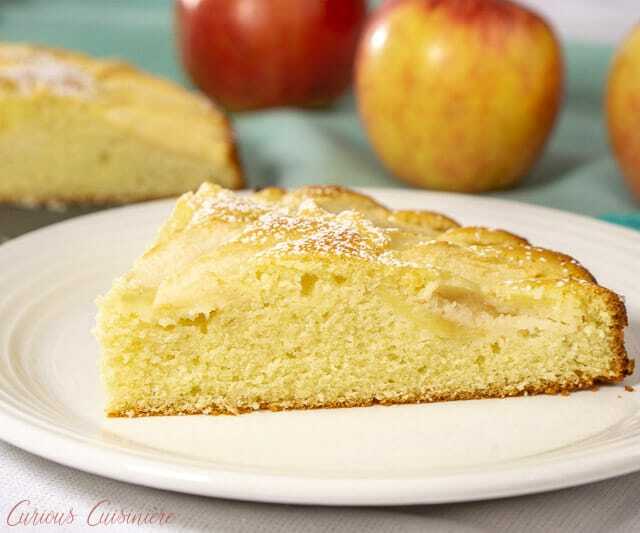 Moist and buttery cake meets fall apples in Apfelkuchen, the classic German Apple Cake. Toss the apple slices and lemon juice together and set aside. In a large bowl, beat together butter and sugar using an electric hand mixer, until pale and smooth. Add eggs and beat until fluffy. Add the flour, baking powder, and salt. Mix until well incorporated. Pour the batter into a greased 10” spring form pan*. Nestle the apple slices into the batter, pushing them into the batter lightly. Bake the cake for 35-40 minutes, until a toothpick inserted in the center of the cake (not into an apple) comes out clean. Remove the cake from the oven and cool for 15 minutes in the pan. Run a knife around the edges of the cake and remove the spring form edge. Let the cake continue to cool on a wire rack. Dust the cooled cake with powdered sugar immediately before serving. *If your spring-form is 9” in diameter, increase the baking time by 10-15 minutes. Do you have a German translation for this recipe by any chance? Hi Chainy. Unfortunatley, we do not. You might be able to use Google Translate to help you translate it. Could I use gluten free flour for this??? Hi Charlotte, We haven’t made this cake dairy free or gluten free. You could try using your favorite gluten free flour, one that acts just like flour. For the butter and milk, you could try coconut oil and almond milk, however, again, we have never done this, so we can’t guarantee the results. If you do give it a try, definitely stop back by and let us know how it turns out for you. Does this cake have to be refrigerated? I wanted to ship it. What do you recommend? Hi Kriss. We have successfully left it out on the counter for 2-3 days. After that we refrigerate it. If shipping, I would make sure it is well padded so it can’t move around at all, and send it for next day delivery. Enjoy! I’ve made this cake twice and both times it’s been a big hit! I appreciate that the cake isn’t too sweet, which really lets the fresh apples shine through. This last time I used a mandoline to ensure consistency of the apple slices, but they came out a bit too thin. Next time I’d use the mandoline to get a thicker slice, or just embrace the rustic-ness of hand slicing the apples. We’re so glad you’ve been enjoying the cake Amy! Thanks for sharing your experience using a mandoline for the apples! I only have a 7 in pop out pan. Should I just increase baking time or also cut back on batter used? Hi Ashley. I would suggest making the batter as directed. If your cake pan is deep and takes all or nearly all of the batter, then you will probably need to increase the baking time. If your cake pan is not extra deep, and not all of the batter is used, then you will probably need to decrease the baking time (maybe start checking it at 30 minutes). You can always put any extra batter into a smaller pan and bake a second cake! Enjoy! Apfelkuchen is really awesome. 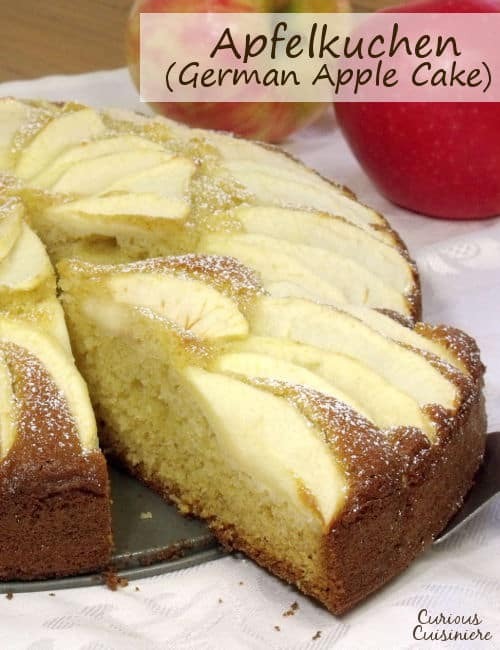 We followed the recipe to bake the german apple cake. Simple steps and amazing cake. This is the closest I’ve found so far to my German grandmothers! I can’t wait to make it! She made it every Christmas. Thanks! Wonderful! We hope you enjoy it! Hello! My daughter and I are preparing this dessert for a German history project. Do we use salted or unsalted butter? Hi Cindy, You should use unsalted butter for the cake. I will go ahead and update the ingredients list. Thank you! Enjoy the cake! I made this for an Ocktoberfest party. I was afraid that it would be dry because I left it in the oven longer than the suggested time waiting for it to brown. It was still pale when I removed it so I drizzeled it with a sauce of melted butter, brown sugar, whole milk, vanilla and walnuts. It was delicious with the sauce, but would have been fine without it. The cake was moist and flavorful on its own.I will make this again! Thanks Carol! So glad you enjoyed the cake! Your sauce sounds like a wonderful addition! Hi K! It is still just as delicious without the powdered sugar topping. But thank you for bringing this to our attention. 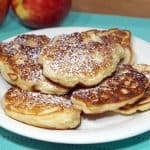 We have updated the recipe ingredients to include the powdered sugar. We hope you enjoy the cake! This cake looks so good! I think I won’t be able to wait until apple season, I want it now! Hi Ali! Thank you so much for your comment and for bringing this to our attention. 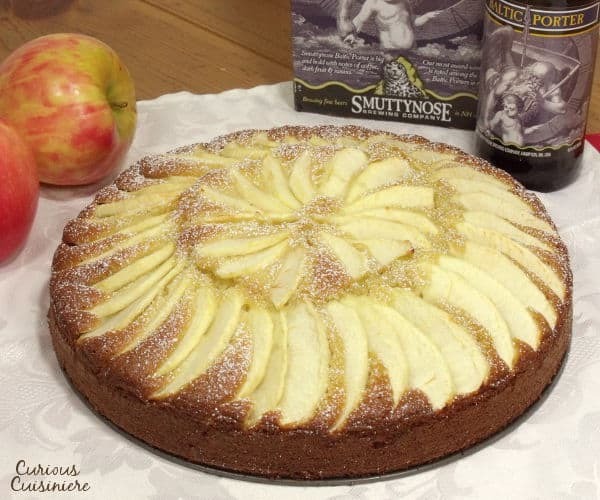 There are two traditional ways of slicing the apples for this cake, and when we made the recipe we tried them both. However, we decided to go with the version where the apples are simply sliced in to thin wedges and fanned around the cake, rather than the version that sets whole apple halves into the cake. But, we had our recipe written up for the other way (because we were SO sure we were going to like that way better). Long story short, we’re so sorry for the confusion in our recipe. We have updated it to reflect the cake that we have pictured. Hopefully this helps. If you still need clarification, please let us know! That sounds like fun! Let us know how it turns out for you! 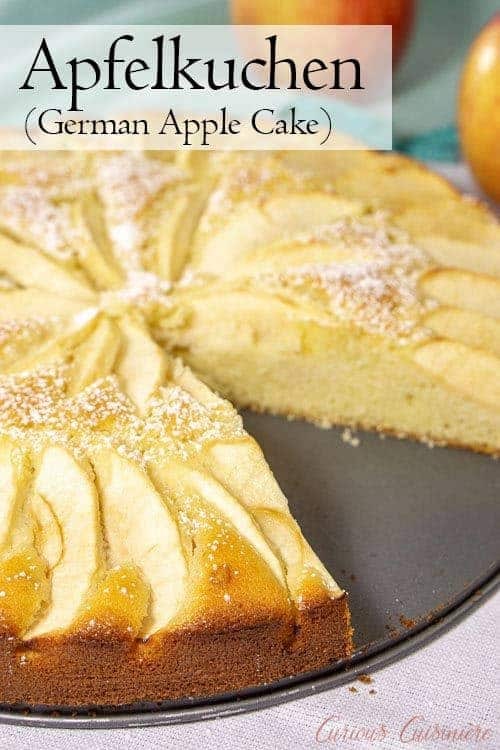 I love German apple cake, my mom used to make it every year! Such a beautiful looking cake! I love that you listed the different types of Apfelkuchen. Thanks Tara! We had fun learning about them! Although I love a good apple pie, I have to go with apple cake if I have a choice. Yours is absolutely beautiful, Sarah! Thank you for sharing the recipe and all the wonderful background info!! Thanks Marion. 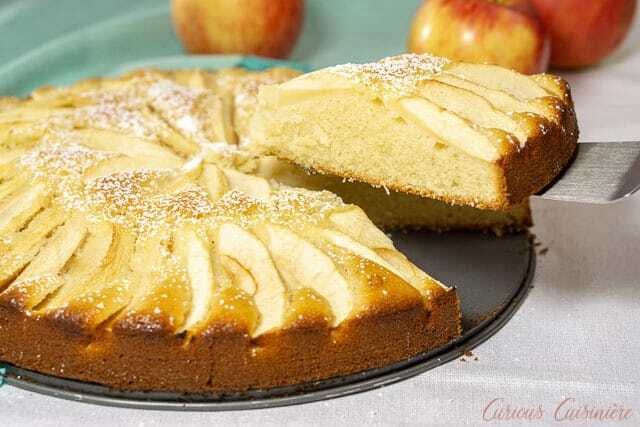 There’s something so comforting about apple cake! Love this cake and your definitions of all the apple options.